Margret Namukose lives in Kakira Jinja, Uganda, with her five children. She sells women's wear in the local Kakira market. Providing for her children is her top priority, and her chief goal was to find a better home in which to raise them. 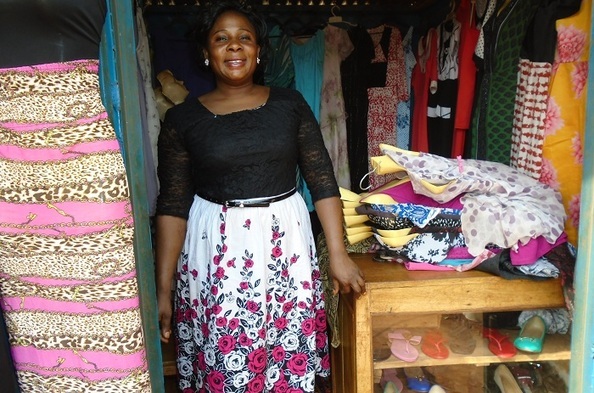 Margret knew she could be doing more to grow her sales, but with barely enough income to meet her children’s basic needs, there was nothing left over to invest in her business. She was resigned to make do with what she had and hope that an she would be able to one day take the next steps to help improve her business. But when Margret learned about the programs offered at Opportunity International through friends and radio ads, she found the avenue for growth that she’d been looking for. She was given valuable financial training and a small loan to invest into a growth plan. Margret applied her lessons and loan into acquiring a greater variety of goods to sell, attracting more customers and increasing her sales. She is seeing the improvements she sought and has since been able to move her family to a better home where she can give them the security and comfort they need. Margret hopes to be able to afford her own plot of land and build rental apartments as an additional source of income for her family. How do entrepreneurs become Opportunity International loan clients? Opportunity International conducts interviews with prospective clients to get a better understanding of their situation, so we can construct a loan that’s tailored to their needs and capabilities. If I help fund a loan, should I expect to be paid back? When you help to fund a loan, you are making a donation to Opportunity International. When those funds are repaid by the client, the funds remain in the country where the original client’s loan was disbursed, so that it can help fund more loans. Your initial gift continues to have an impact after the first loan is repaid.